We can help extended your home with an energy efficient, fast build single story extension offering a wide range wide of design options and features that your builder can’t! An extension will blend seamlessly with your home, providing substantial extra living space that can be harnessed for a wide range of uses. Whether you are looking for a contemporary or traditional extension to your home, we can provide a highly functional, flexible and luxurious new living space. With single storey extensions now more cost effective than ever, homeowners are increasingly looking to extend their home with a larger new kitchen, a dining area or a simply a place to relax. Sit inside an extension and you feel that you are in the most impressive room in the house, thanks to a number of our unique design features. 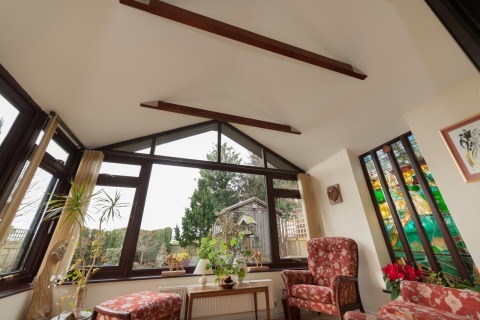 Choose one of our extensions and we’ll create a true sense of space with vaulted ceilings and the added benefit of more light from the world outside with the option of a Velux rooflight. An extension is also highly energy efficient and can be connected to the boiler in most instances or even designed with underfloor heating. To the outside an extension looks very much part of the house with a number of tiled options, including the ability to match the existing tiles of your house. Like our conservatories and GardenRooms, our extensions are available with windows and doors in a wide range of lifelike woodgrains such as Irish Oak and beautiful colours such as Chartwell Green. We can also offer 4 different tile finishes. Through our network of Registered Installers we’ve been installing windows, doors and conservatory roofs with colour foils for over 10 years now and in recent years have added a number of options with all accessories in a matching finish. Residence 9 is our premium window and door system that offers period detailing, exclusive foil finishes and a striking flush finish. At present we are the only company in the UK capable of manufacturing a complete R9 conservatory and GardenRoom. Our extensions are designed to seamlessly integrate with your house and for that reason we can offer four tiled finishes each carrying a 25 year warranty, including slate grey, pewter grey, red and chestnut brown. 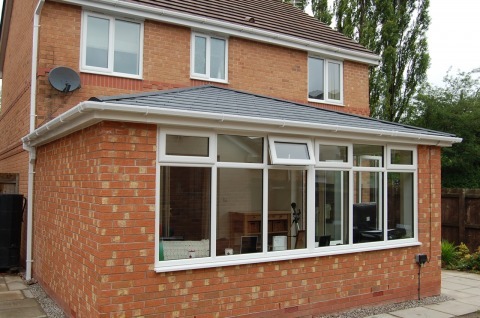 Or we can match your existing roof tile. Choose an extension from A New Room and you can be re-assured that you are dealing with expert professionals from design, survey and though to installation. There are a number of design features that you can add to your extension including flush downlighters, Velux rooflights and even the latest and stylish bi-folding doors.